​Launched in May 2016, The Sol Project is a national theater initiative that works in partnership with leading theater companies to amplify the voices of Latinx playwrights and build artistic homes for artists of color in New York City and beyond. Guided by our core values of joy, rigor, and generosity – The Sol Project works to radically shift the frequency with which Latinx playwrights are produced on our city’s most visible stages. We work to fortify a growing national movement within the Latinx community to create a more just and inclusive theatrical landscape. ​The Sol Project champions singular Latinx voices to build a bold, powerful, and kaleidoscopic body of work for the new American theater. The Sol Project aims to fortify a national theater movement that brings Latinx playwrights and their stories to the forefront of the theater field. 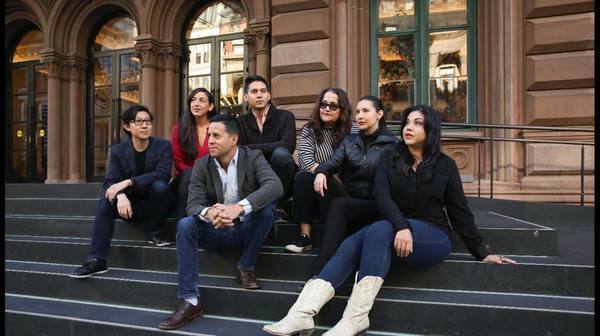 The Sol Project pairs 12 outstanding Latinx playwrights, at various career stages, with 12 top Off-Broadway companies to execute mainstage New York productions of each playwright’s work (one playwright, to one company). In tandem, The Sol Project cultivates national partnerships with theaters across the country to provide additional platforms of support for these and other Latinx playwrights through readings, workshops, or productions. As of June 2018, The Sol Project has championed four writers – Hilary Bettis, Martín Zimmerman, Luis Alfaro and Charise Castro Smith – with three New York productions completed and the first national production planned for fall 2018. As a part of their partnership with The Sol Project, all our partners also agree to commission a new play by a Latinx playwright for future production, ensuring that we are seeding the field with fresh work by Latinx voices. ​Once all 12 writers have been produced Off-Broadway, the work of The Sol Project will formally conclude. We hope the 12 New York productions, in tandem with the work done by our national partners, will catalyze systemic change, instigate lasting creative partnerships, and inspire collective impact across the artistic landscape. Critical to The Sol Project's success​ is the selection of partners who share our passionate belief that the American theater should be a space that holds all our stories; Our partners understand that, to realize this long-term goal, we must dismantle the systems that perpetuate racism and white supremacy and stand ready do this urgent work. The Sol Project is motivated and sustained by the unique strengths that emerge from our powerful, carefully constructed alliances. ​The Sol Project aims to create opportunities that launch and maintain influential boundary-breaking careers in the American theater. In addition to Latinx playwrights, The Sol Project advocates for other artists of color in assembling creative teams for each production in which we are involved. We also call for casts to be primarily Latinx and/or people of color, and we nurture a growing network of directors, designers, stage managers, producers, dramaturgs, technicians and other creative talent. ​The Sol Project works nimbly and respectfully with each of our writers and partners throughout all aspects of our productions to achieve a shared vision. As cultural translators, representatives from The Sol Project ensure that the initiative’s guiding principles (“Our Pillars”) are consistently and comprehensively integrated into each stage of the creative process – from pre-production to marketing; we add value and expertise that deliver authentic and meaningful experiences for both artists and audiences. ​We aspire to make a lasting impact by radically shifting the frequency with which Latinx playwrights are produced on the country’s most visible stages. We will work with scholars, journalists and others to document the work of this historic initiative and the contributions of our collaborators, our artists, our organizations, and our communities. We will not rest until the American theater reflects the changing face of our country. The Sol Project’s artistic collective is composed of: Claudia Acosta, Adriana Gaviria, Rebecca Martínez, David Mendizábal, Jacob Padrón, Julian Ramirez, Joey Reyes, and Laurie Woolery. Our collective extends further to include: Brian Herrera (Resident Scholar), Stephanie Ybarra (Resident Dramaturg) and two of our Founding and Advisory Circle members: Elena Araoz and Kyoung Park. Our Honorary Board includes Junot Díaz, Raúl Castillo, Priscilla Lopez, Sandra Marquez, Edward James Olmos, John Ortiz, Tony Plana, Chita Rivera, Diane Rodriguez, Rosalba Rolón and Daphne Rubin-Vega. Our current partner theaters include: Berkeley Repertory Theatre, Cara Mía Theater Company, Center Theatre Group, LAByrinth Theater Company, New Georges, MCC Theater, Oregon Shakespeare Festival, Playwrights Horizons, Rattlestick Playwrights Theater, The Playwrights Realm, The Public Theater, WP Theater and Yale Repertory Theatre. Padrón conceived The Sol Project after attending the 2013 Latinx Theater Commons﻿ (LTC) National Convening in Boston, a movement that aims to transform the narrative of the American theater by increasing presence of Latinx works. He realized that if true representation of Latinx Stories on America’s stages was to be possible and true, something needed to change locally first. Considering the credence many regional theaters give to the vibrant ecology of the New York theater scene, Padrón was driven to build this initiative in order to activate and unite the historically bifurcated Latinx theater community in New York with the ultimate goal of inciting change nationwide. Inspired by the playwrights’ collective 13P, Padrón devised a model for a highly visible platform for Latinx playwrights in New York City and beyond. In August 2014, the LTC hosted a day-long meeting for leading New York City Latinx theater artists and scholars. The insight gained from this gathering nurtured the development of The Sol Project and the goal to work towards gathering the collective wisdom of the community to answer the question: What does the Latinx theater community in New York City need in order to continue growing and expanding? After its jumpstart, the conversation and planning for The Sol Project continued. By December 2014, a New York City-based artistic collective assembled to begin building and bringing the initiative to fruition. The Sol Project officially launched its initiative in May 2016 with the announcement of the Project’s first production and inaugural theater partnership- the world premiere of Hilary Bettis’ “Alligator”, directed by Elena Araoz at New Georges Theater in November 2016. This production coincided with the 2016 Latinx Theatre Commons NYC Convening in December, hosted by The Public Theater, Sol’s third producing partner for Luis Alfaro’s “Oedipus El Rey”. Our most recent collaboration is with our fourth partner, Yale Repertory Theater, producing Charise Castro Smith’s “El Huracán”.